All Wildflower Pavilion tickets are NON-REFUNDABLE. No exceptions. 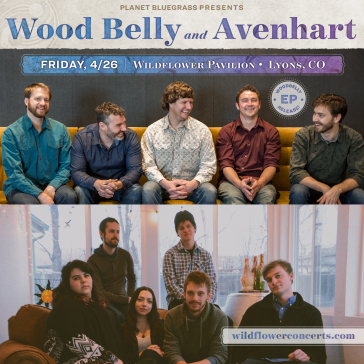 Avenhart is a Denver-based folk band that twists a foundation of bluegrass into their love for soul, Americana, pop, and indie rock, creating a unique soundscape that centers around soulful harmonies, intricate arrangements, and heartfelt lyrics. The six-piece string band met at University of Colorado Denver and formed a bond over their love of Tony Rice and The Stanley Brothers. In January of 2015, Andrea Parés (vocals), Payden Widner (guitar), Alex Drapela (banjo), and Olivia Shaw (fiddle and vocals) decided to make it official. In the fall of 2017, they were joined by Clint Koury (mandolin and vocals) and Gil Clark (bass). Together, they strive to write authentic music that they love to share with the world. In March of 2017, Avenhart released their first-ever, self-titled EP. Since then, they have released several singles and hope to record a full-length album in early 2019.